DisplayLink Display Adapter C05D is a USB Display Adapters hardware device. This Windows driver was developed by DisplayLink Corp.. In order to make sure you are downloading the exact right driver the hardware id is USB/VID_17e9&PID_C05D&MI_00. 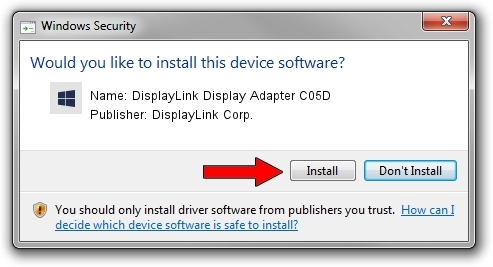 Download the setup file for DisplayLink Corp. DisplayLink Display Adapter C05D driver from the link below. This is the download link for the driver version 7.7.60366.0 released on 2015-02-12. Start the driver installation file from a Windows account with the highest privileges (rights). If your User Access Control (UAC) is enabled then you will have to confirm the installation of the driver and run the setup with administrative rights. Go through the driver setup wizard, which should be pretty easy to follow. The driver setup wizard will analyze your PC for compatible devices and will install the driver. Shutdown and restart your PC and enjoy the fresh driver, as you can see it was quite smple. This driver was rated with an average of 3.3 stars by 62618 users. The advantage of using DriverMax is that it will setup the driver for you in the easiest possible way and it will keep each driver up to date, not just this one. 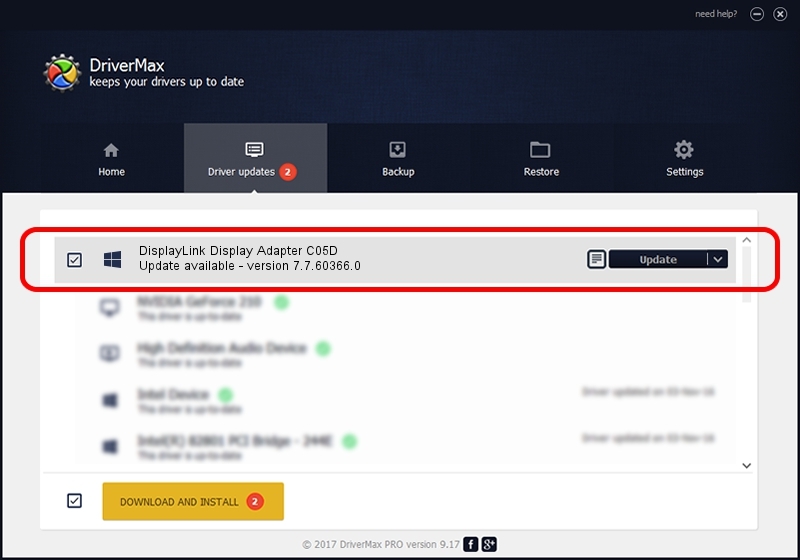 How easy can you install a driver with DriverMax? Let's see! Start DriverMax and press on the yellow button that says ~SCAN FOR DRIVER UPDATES NOW~. Wait for DriverMax to scan and analyze each driver on your PC. Take a look at the list of available driver updates. Search the list until you find the DisplayLink Corp. DisplayLink Display Adapter C05D driver. Click the Update button.